All printers come with a 1-Year Limited Warranty and unlimited lifetime phone support. 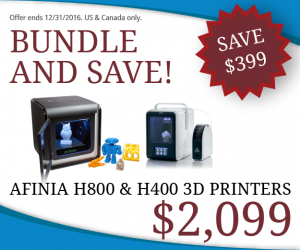 The Afinia H480 3D Printer is our highly acclaimed “workhorse.” The Afinia H480 technology was awarded “Easiest to Set Up, “Easiest to Use,” and “Reliable Performer” by MAKE: Magazine, and continues to gain praise from those who use it. The H480 features a 5-inch cubed build area, auto-leveling platform calibration, and nozzle height detection. Our largest 3D printer, the H800, is popular among educators, businesses, and hobbyists alike. With a 10 x 8 x 8 inch build platform, HEPA air filtration system, and ultra-fine 100-micron print resolution, the H800 is a great choice for anyone needing high-quality prints, right out-of-the-box. The newest addition to the H-Series 3D printer line is the H400. The H400 features highly anticipated WIFI connectivity, touch screen control, and power failure protection, while continuing to feature customer favorites like HEPA air filtration, software-assisted leveling, and automatic height detection. Ease-of-use and reliability continue to make this H-Series addition a top choice for educators, hobbyists, and engineers.